Riede (location) in the municipality Zöbing-Langenlois in the Lower Austrian wine-growing region Kamptal, The "Zöbinger Heiligenstein" is a viticultural landmark of the Kamptal and was already mentioned in 1280 in a monastic list as "Hellenstein" (Hellstone). It is a closed nature reserve. Between the vineyards there are strictly nature protected dry grassland areas with a flora and fauna, as they are otherwise only found in far more southern, Mediterranean areas. 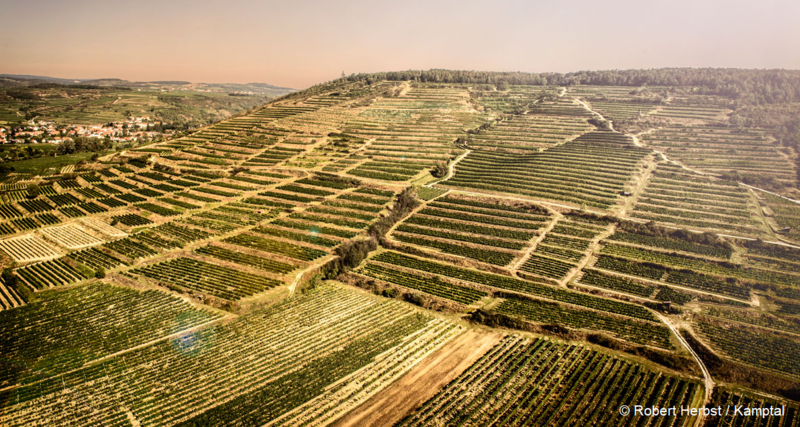 Geographically, the Heiligenstein is a 360 meter high mountain peak of the southern Manhartsberg, which is predominantly wooded and planted only on the southern slope with vines. The name derives from the "hellish sun" that burns down on this mountain and causes a hot, dry microclimate. So he has no religious or religious background. Due to the shell-shaped kettle layer open to the south, a special microclimate results. During the day, the vines heat up due to the intense sunshine and at night they cool off through the winds from the higher Waldviertel. This will promote the fruit flavors. This page was last modified at 10 October 2017 at 11:05.